Going to the beach is a lot of fun, and camping there is even funner. But when it comes to making the most of any outdoor gathering, most people agree that having a fun game to play benefits everyone. It helps the time pass if things get boring, and makes teamwork communication stronger between new acquaintances. 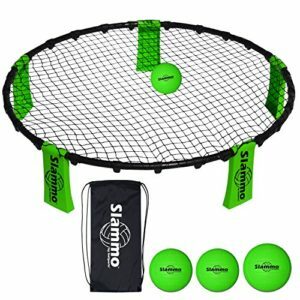 The GoSports Slammo Game Set is rated very highly at Amazon, is super easy to assemble, and 4 people can play it at once. It’s like volleyball, only the net is close to the ground and features a circular shape. The object of the game is to return the ball to the circular net within 3 “hits”, so that it bounces off the net and triggers the “3 hit rule” to begin again with either team. Even if one team returns the ball to the net within 3 hits, it can still bounce to a member of the same team a second time. This engages the same team into another 3 hits, just the same. If a team is unable to return the ball to the net within 3 hits, they lose. This is a beach game that will quickly teach you your place as far as hand skill goes. But from there, you can get really good at the hand-eye coordination required to play like a champion. For example, the ball can bounce off the net at a low height, requiring you to kneel down to knock it over to another player. And you’ll quickly learn that precise amounts of force are required to knock the ball over to a teammate successfully. Go Sports Slammo definitely trains you to work with your hands more fluently.